Frank Milne of Everett, MA, produced boilers for early steam automibiles. 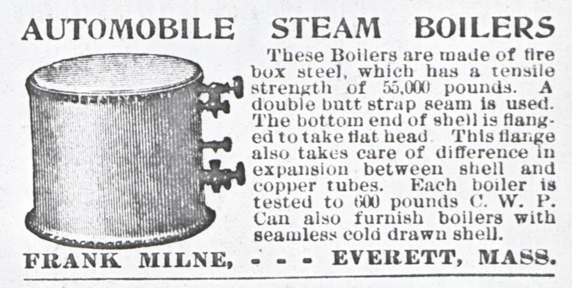 This advertisement for steam car boilers appeared in 1901 in an unidentified magazine. Photocopy. John A. Conde Collection. Contact us if you have additional information about Frank Milne of Everett, MA, or if you have questions.